Little Constellation is a project and an international network for contemporary art, which focuses its research on the symbolic sensitivity of the geographic dimension. 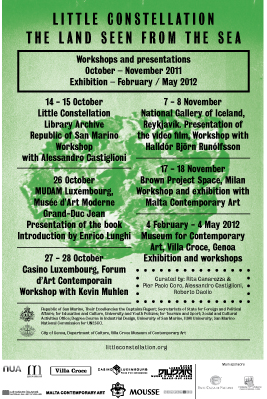 Highlighting the different possible relationship between the geo-cultural centres and peripheries, through a plan of knowledge taken to the extreme of opposition and resistance between the concepts of proximity and distance, from January 2012, at the Museo di Villa Croce in Genoa, it will present the exhibition The Land Seen from the Sea. Little Constellation conducts research devoted to the complex theme of isolation, which finds its definition in the dimension of the island (both geographically, but naturally also linguistically). Isolation and the network of relationships are thus intertwined as fields of a single front. We live around a sea like frogs around a pond, declared Socrates. This brings out the fact that the peoples of antiquity owed their prosperity and relations to the great sea (almost enclosed like a pond) that is the Mediterranean. It is this duality between distance and vicinity that the research project seeks to focus on. This research therefore focuses on the Mediterranean by starting from particularly sensitive areas, such as Montenegro, Malta, San Marino, Cyprus, Gibraltar, Ceuta, and also other areas with which it is possible to make cultural and geographical comparisons, such as Iceland, Luxembourg, Andorra and Liechtenstein. Specifically, the multiple identities of the Mediterranean will be examined through three nuclear and seminal case studies, compared with the different cultures encountered in this small basin. With Yuula Benivolski (CA); Justine Blau (LU); Canarezza & Coro (SM); Martina Conti (SM-FR); Nina Danino (UK); Oppy De Bernardo (CH); Hekla Dogg Jonsdottir (IS); Doris Drescher (LU); Haris Epaminonda (CY); Barbara Geyer (FL); Anna Hilti (FL); Irena Lagator (ME); Jose Ramón Lozano (ES); Ingibjörg Magnadóttir (IS); Mark Mangion (MT); Mussoni & Albani (SM-FR); Giancarlo Norese and Umberto Cavenago (IT); Christodoulos Panayiotou (CY); Paradise Consumer Group (AD); Marco Poloni (CH); Pierre Portelli (MT); Luigi Presicce (IT); Agnès Roux (MC); Sigurður Atli Sigurðsson (IS); Miki Tallone (CH); Xenia Uranova (RU); Martin Walch (FL); Trixie Weis (LU).